It's always one thing to see a still picture of a child at work, or of a Montessori environment, but it's a completely different thing to see a video. A video can give you a very real sense of how an environment and child work and feels, and a realistic expectation for how Montessori works in real life. Plus they are just great to watch! I have been trying to be better about posting videos of my children working instead of just still pictures. This DIY sink and kitchen prep area is to die-for! And watching Rosie work is just a joy! I love watching the movement of this fantastic mobile! I could literally watch babies work all day. I could also watch children working on traditional Montessori materials all day. I love this look at the hundred chain. This time lapse video of a child using the stamp game is equally fascinating! Here is another amazing example of a baby concentrating! This is just so fantastic, the tiny baby, the Munari mobile, the mat! It's all so beautiful. You want to know what real toddler practical life looks like? This is it! This is the transfer work that toddlers should be doing! I love this look at shoe polishing! What a simple and engaging practical life work. Hopefully, you have enjoyed these glimpses into Montessori homes and classrooms! 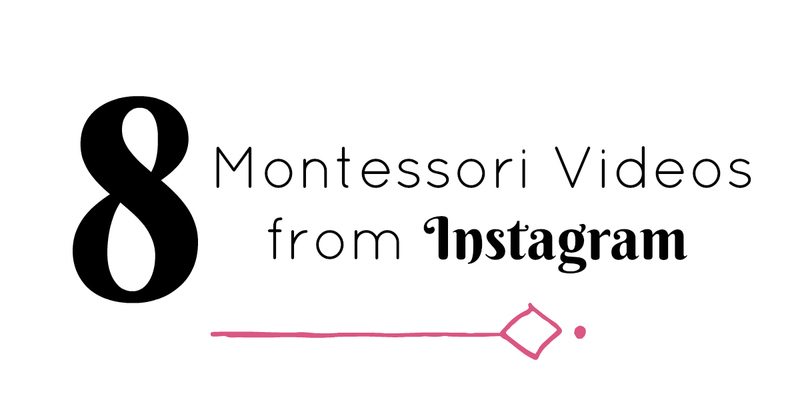 What are your favorite Montessori videos? This is awesome, I'm excited to follow some of these people I was unfamiliar with, thanks for sharing!